KARACHI: The ruling Pakistan Muslim League-Nawaz (PML-N) and its chief, former Prime Minister Nawaz Sharif, have retained the top spot as the most popular party and politician in Pakistan, results of the nationwide Jang Geo News Poll have revealed. The opposition Pakistan Tehreek-i-Insaf (PTI) and its chairman, Imran Khan, have been voted as the second most favourite political party and leader in the survey, conducted last month in collaboration with Gallup Pakistan and Pulse Consultant. Of the respondents interviewed by Gallup Pakistan, 34% said they would vote for PML-N if elections were held today, followed closely by PTI at 26%. 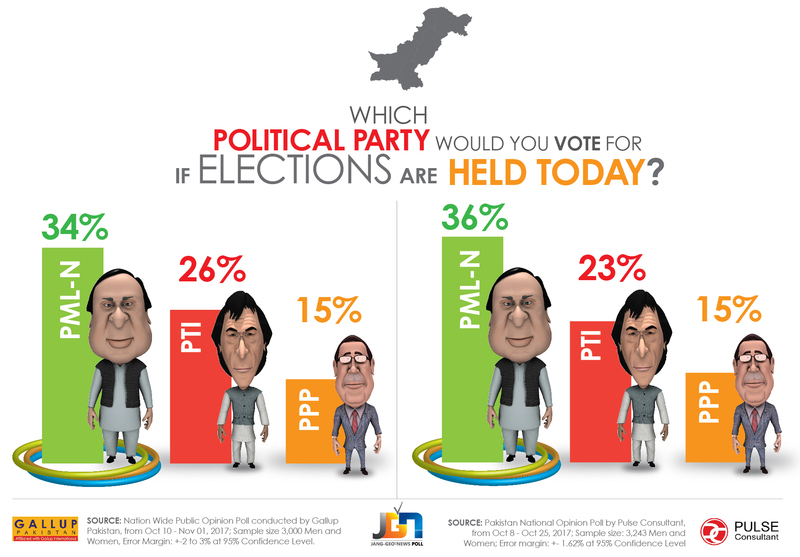 15% say they would vote for the Pakistan People's Party (PPP). 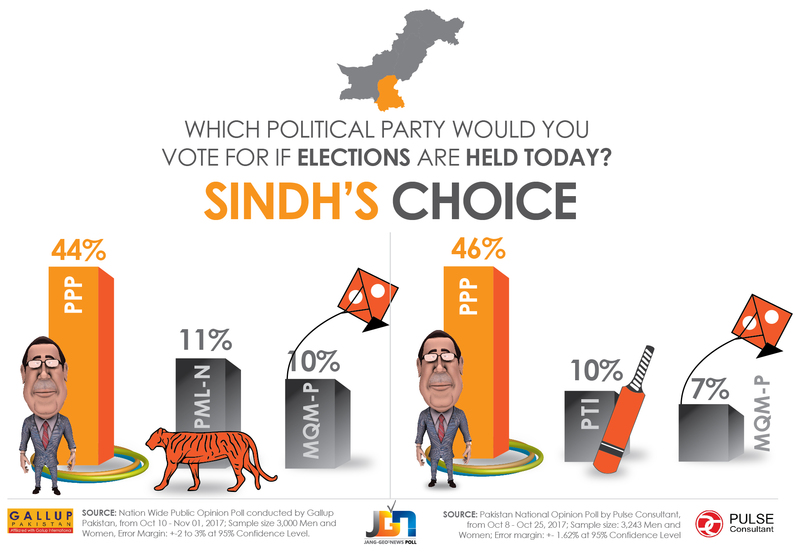 The Pulse Consultant survey showed very similar results, with 36% siding with PML-N, 23% opting for PTI, and 15% going with PPP when asked who they would vote for if elections were held today. The situation varied at the provincial level. The PML-N emerged as the most popular party in Punjab, while PTI continued its position as the leader in Khyber Pakhtunkhwa. The PPP also remained the most popular party in Sindh. In Punjab, 50% respondents sided with PML-N while 31% said they intend to vote for PTI if elections are held today, according to the Gallup Pakistan poll. 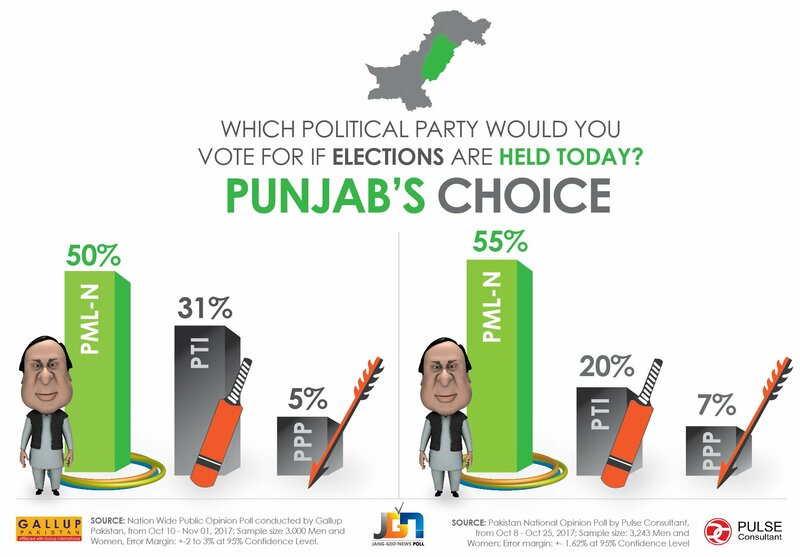 In the Pulse survey, 55% of Punjab-based respondents opted for PML-N while 20% chose PTI. In the Gallup Pakistan survey, 44% respondents from Sindh said they would vote for PPP, with a similar percentage (46%) opted for the party in the Pulse survey. 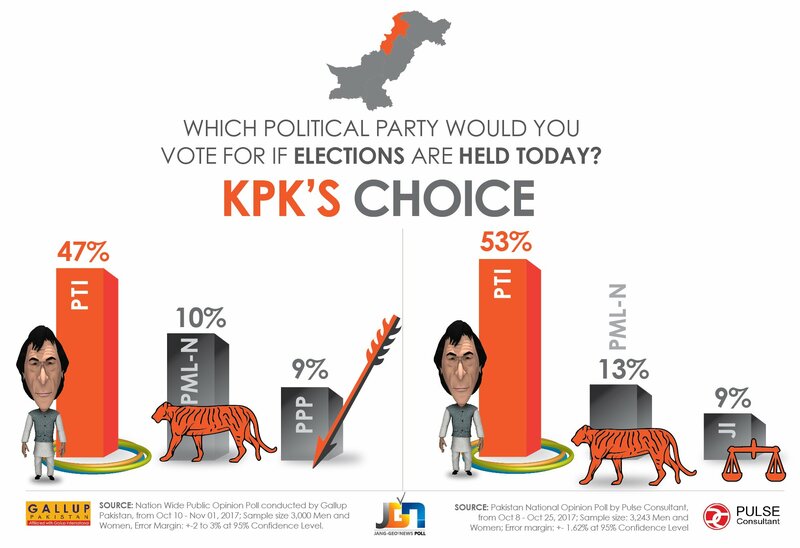 PTI held the top slot in Khyber Pakhtunkhwa, 47% according to the Gallup Pakistan survey and 53% in the Pulse Consultant poll. 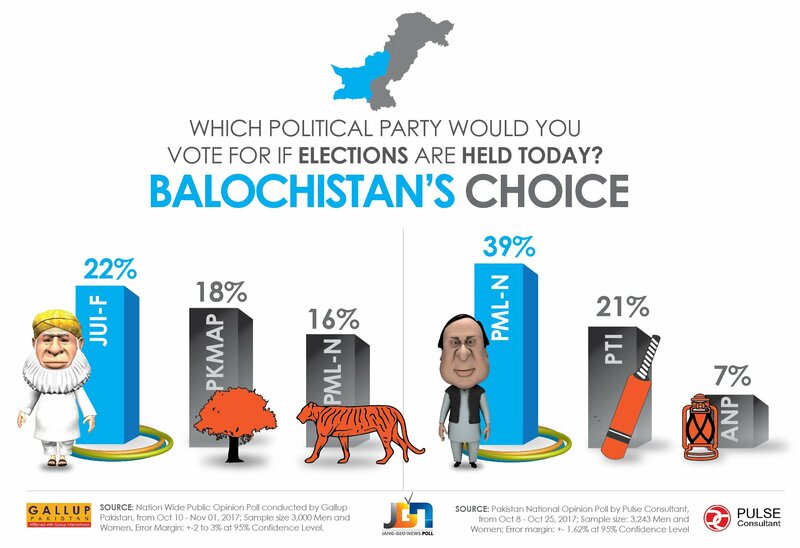 The two surveys showed different results from Balochistan, with 39% siding with PML-N in the Pulse Consultant poll and the Gallup Pakistan survey showing JUI-F (22%), PkMAP (18%), and PML-N (16%) as the top three parties in the province. The PPP was also chosen by most respondents (Pulse: 19%, Gallup: 24%) when asked which political party they would not want to vote for at all. It was followed by PTI (Pulse: 15%, Gallup: 23%) and PML-N (Pulse: 17%, Gallup: 19%). 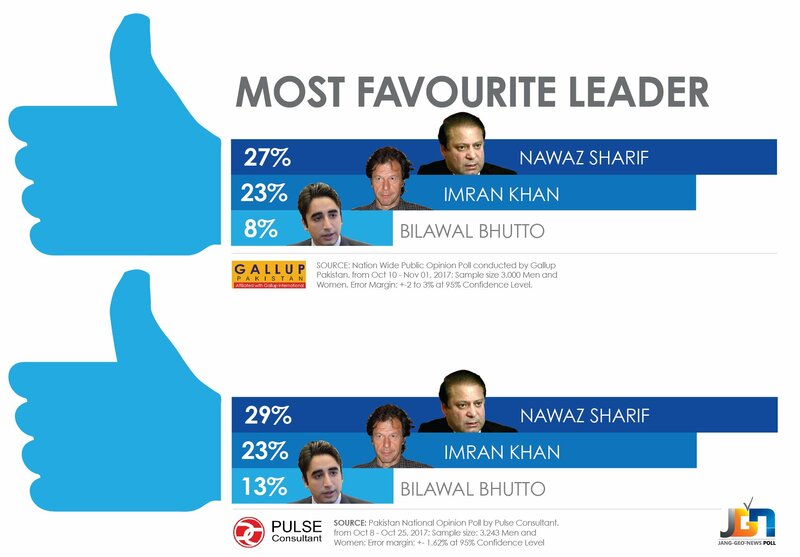 In both surveys, former Prime Minister Nawaz Sharif emerged as Pakistan's favourite leader (Pulse: 29%, Gallup: 27%), followed closely by PTI chief Imran Khan (Pulse: 23%, Gallup: 23%) and PPP's Bilawal Bhutto-Zardari (Pulse: 13%, Gallup: 8%). Interestingly, a larger percentage of women (33%) chose Nawaz Sharif as their favourite leader as compared to Imran Khan (16%) and Bilawal Bhutto-Zardari (16%), according to the Pulse Consultant poll. In both surveys, Shahbaz Sharif was chosen as the most favourite PML-N leader after Nawaz Sharif (Pulse: 50%, Gallup: 50%), followed by Maryam Nawaz (Pulse: 10%, Gallup: 11%) and Chaudhry Nisar Ali Khan (Pulse: 8%, Gallup: 8%). Similarly, Shah Mehmood Qureshi emerged as the most favourite PTI leader after Imran Khan (Pulse: 25%, Gallup: 36%), followed by Jahangir Tareen Khan (Pulse: 15%, Gallup: 15%). 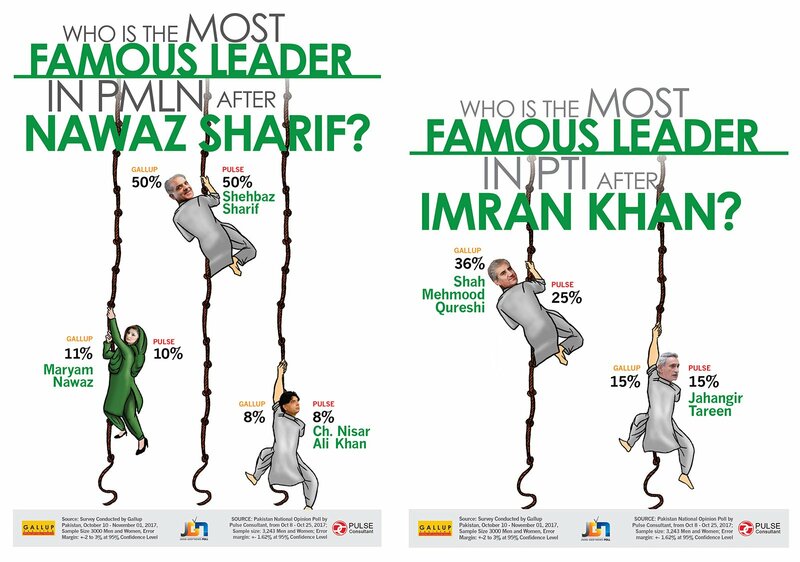 Ironically, Nawaz Sharif was also chosen by the highest number of respondents (27%) as their least favourite leader, followed by PPP's Asif Ali Zardari (24%), and Imran Khan (20%). A large percentage of Pakistanis think the Supreme Court was right in its decision to disqualify former Prime Minister Nawaz Sharif, but a significant portion of the population also believes the decision was not correct. 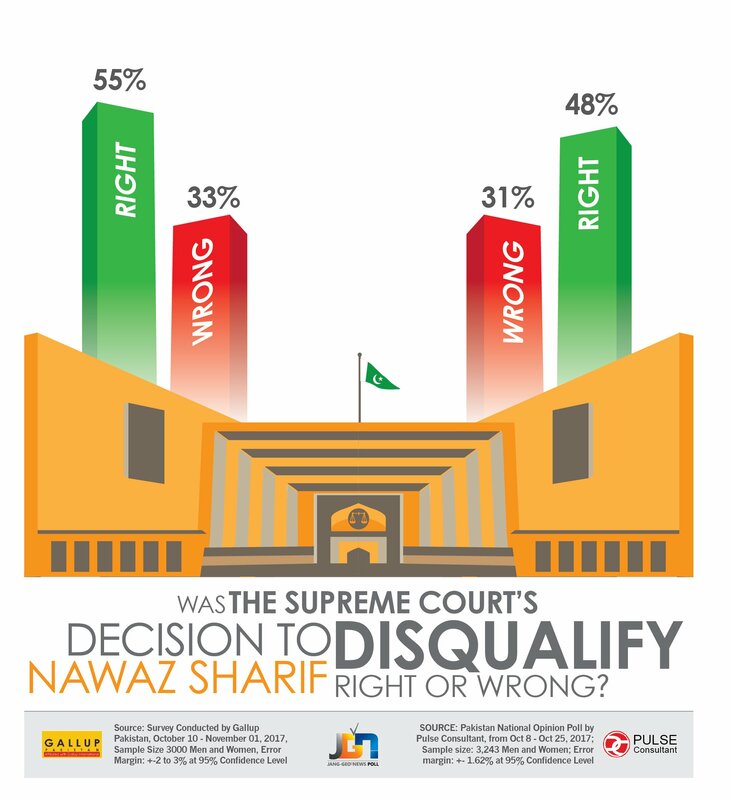 According to the Gallup survey, 55% respondent said the apex court's verdict was right while 33% were not in favour of the former prime minister's disqualification. 11% chose to remain silent on the matter. Meanwhile, the Pulse survey showed similar results, with 48% siding with the Supreme Court judgment, 31% against the disqualification decision, and 21% choosing not to comment on the matter. Respondents were then asked whether, in their opinion, the Supreme Court’s verdict on the Panama Case was right or wrong. 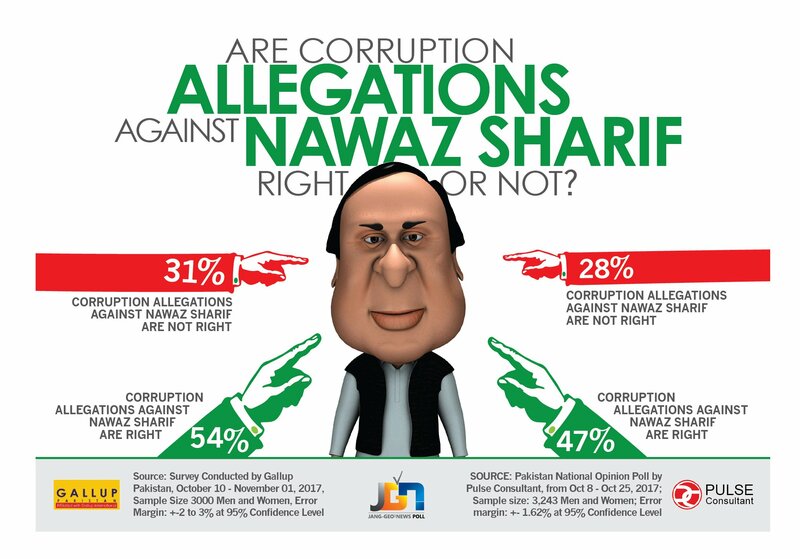 Both surveys showed that a significant portion of the population believe the corruption allegations against Nawaz Sharif have some validity in them (Gallup: 54%, Pulse: 47%) while a large percentage (Gallup: 31%, Pulse: 28%) said the allegations have no merit. 16% of the respondents in the Gallup Pakistan survey and 24% of the people interviewed by Pulse Consultant did not wish to answer the question or said that they hold no opinion on the matter. Who would form government in 2018? About one-third of Pakistanis feel the PML-N would once again form the government at the federal level after the upcoming general elections in 2018. According to the Gallup Pakistan survey, 31% respondents said the PML-N would form the government, followed very closely by those who say PTI at 26%. 13% were of the view that PPP would be able to form a government, while 8% said that they will not cast their vote in the upcoming elections. Similarly, 37% of the respondents in the Pulse Consultant survey believed that the PML-N would form the next government, followed by PTI (27%), and PPP (16%). PML-N was chosen by most Punjab-based respondents (Pulse: 54%, Gallup: 45%) as most likely to form a government at the federal level. On the other hand, most respondents from KP chose PTI (Pulse: 53%, Gallup: 47%), while most Sindh-based respondents chose PPP (Pulse: 51%, Gallup: 41%) as most likely to form the federal government after the 2018 elections. More than half (61%) of the respondents interviewed by Gallup Pakistan believed the winning party would get a clear mandate in the 2018 elections and that a coalition government would not be needed. According to the Gallup Pakistan Survey, almost one-third of the respondents (35%) said they were not interested in politics. On the other hand, 39% said they were either very interested somewhat interested in politics. At the same time, 74% respondents said it was likely they would vote in the 2018 elections. 24% respondents said they have either not thought about voting or think they would not vote at all in the upcoming elections. A large majority of respondents interviewed by Gallup Pakistan (88%) thought they were registered to vote in their home constituencies. 48% respondents in the Pulse Consultant survey said they were not interested in politics, while 32% said they had an interest in politics. At the same time, almost three out of every four persons—74% of the respondents in the Gallup Pakistan survey and 78% of the respondents in the Pulse Consultant survey—said they were likely to vote in the upcoming elections. With regards to PTI chief Imran Khan’s call for dissolution of parliament and early elections, more than half of the respondents interviewed in both surveys opted against holding elections immediately. A large majority (Gallup: 60%, Pulse: 70%) of the respondents were of the view that the current government should be given a chance to govern until general elections scheduled for 2018. Note from Editor/Disclaimer: The Jang-Geo-News poll is carried out regularly on a national level according to internationally recognised principles of scientific polling. Large media houses across the world carry out these surveys to assess the perception and opinions of the public. In order to make it more balanced and transparent, the Jang-Geo-News poll was carried out in collaboration with two different research agencies—Gallup Pakistan, one of the renowned survey companies in Pakistan, and Pulse Consultant, one of the fastest growing research agencies in the country. The results represent public opinion computed on the basis of views expressed by anonymous respondents selected randomly and interviewed face-to-face. Such surveys contain a margin of error, and should not be taken as a basis for casting votes. The combined sample size of the study was more than 6,000 households. Gallup Pakistan carried out the survey from October 10 to November 1 using an error margin of +-2 to 3% at 95% confidence level, while the parallel research by Pulse Consultant was conducted from Oct 8 to Oct 25 with a margin of error of 1.62% at 95% confidence level.